Hyundai i10 Interior, Sat Nav, Dashboard | What Car? The driver’s seat is supportive enough, although entry-level S trim doesn’t have seat-height adjustment. The steering wheel moves up and down only, not in and out, but while that’s certainly an omission, it’s a common deficiency in the city car class. The seat is set quite high, even in models that have seat height adjustment (from SE and up), and it could also be easier to adjust the angle of the backrest, which is managed with a ratchet lever rather than the multi-adjustable action of a wheel. Still, the pedals are well positioned and the dashboard is logically laid out with simple controls all within easy reach. It’s not overloaded with buttons, either, while those that are there are clearly marked. You have to go for Premium trim to get height-adjustable front seatbelts, so the seatbelt is more likely to rub your neck in lower-grade models. The view out the front of the Hyundai i10 is very good indeed. A tall windscreen and relatively slim pillars make it easy to see what’s going on. However, the window line rises towards the back of the car and the rear pillars are quite chunky, so there are blind spots to be wary of. Only the range-topping Premium SE trim comes with rear parking sensors. i10 owners have in the past complained that the air-conditioning isn’t very effective at de-misting the windscreen. There’s no fancy colour screen on base models, but technophobes will appreciate its simplicity. It's easy to use and offers most of the important functions, including a CD player and a USB socket, the latter of which allows you to charge your phone and play music stored on it through the two-speaker stereo. However, it's disappointing that Bluetooth and controls on the steering wheel aren’t available – even as an option. To get these things you have to upgrade to SE trim, which also brings a DAB radio and a couple of extra speakers. Mind you, sound quality is still nothing to write home about. Premium trim adds a docking station for your smartphone (effectively a cradle that can hold it on top of the dashboard). However, if you're considering Premium trim, it is well worth stretching your budget to Premium SE, which features an easy-to-use 7.0in touchscreen infotainment system with Apple CarPlay and Android Auto smartphone mirroring apps. You also get sat-nav with a seven-year subscription to 'live' services, which include real-time traffic information and local weather updates. 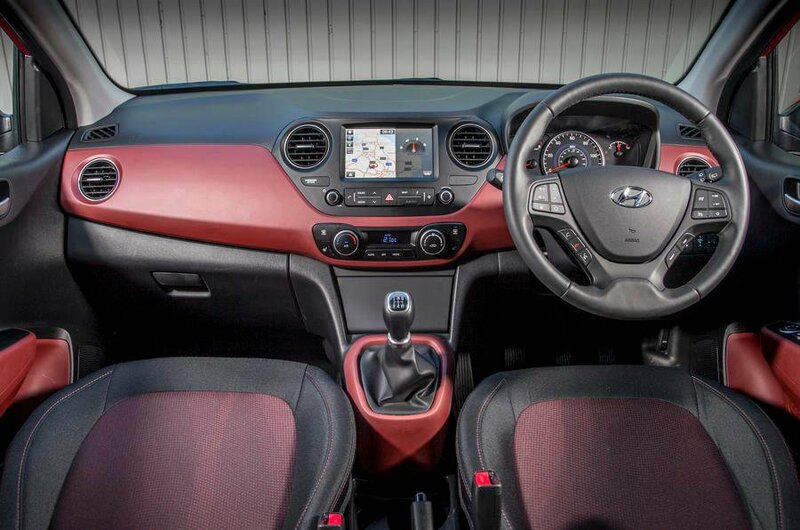 As is the case in almost all city cars, the i10's interior plastics are hard and unforgiving. 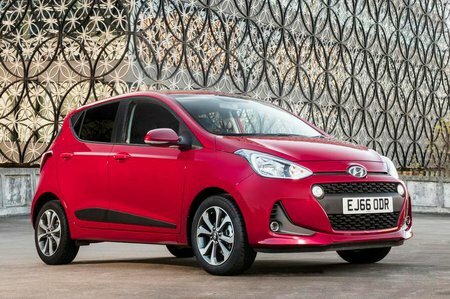 However, they are at least pleasingly textured, so the i10 doesn't feel as low-rent inside as many of its rivals. True, there are a few bits of shiny plastic on show, the air vents feel a touch flimsy and there are some sharp edges around the base of the seats, but otherwise everything feels solidly screwed together and of a good quality by class standards. Depending on which exterior paint colour you go for, the main part of the dashboard and the centre of the seats are available in a range of different colours, including red and blue, to brighten things up a bit. 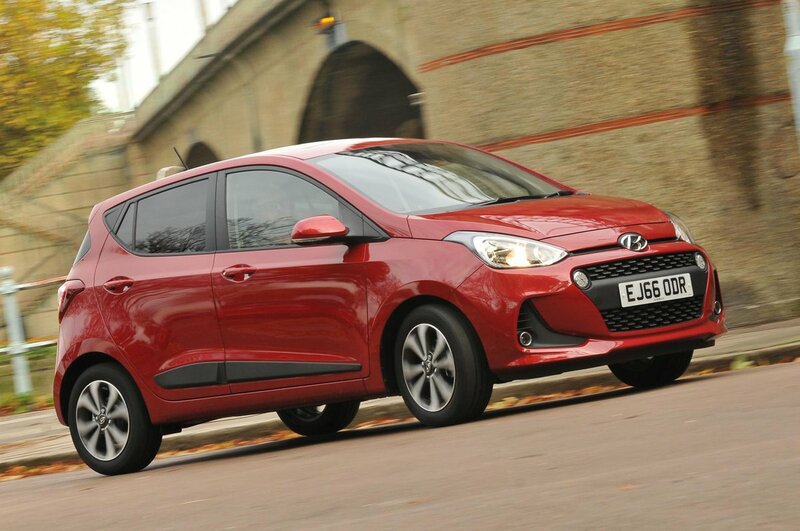 Arguably it’s still one of the blander cars in the class though, even judged against its sister car, the Kia Picanto.